Preheat oven to 180°C (350°F). Heat the oil in a large non-stick frying pan over high heat. Sprinkle the lamb with salt and pepper and cook, in batches, for 2–3 minutes each side or until browned. Place in a large deep-sided roasting pan and set aside. Wipe out the frying pan and add the stock, garlic, maple syrup, sugar, vinegar, orange peel and juice and the rosemary. Bring to the boil and pour over the lamb shanks. Cover tightly with aluminium foil and roast, turning the shanks half way through cooking, for 2½ hours or until the shanks are tender. Increase the oven temperature to 220°C (425°F). Remove the foil and roast, uncovered, turning the shanks every 15 minutes, for a further 45–50 minutes or until glossy and sticky. While the lamb is cooking, make the mint sauce. Place the vinegar and sugar in a small saucepan over medium heat and stir until combined. Bring to the boil and cook for 5–6 minutes or until just thickened. Allow to cool completely, add the mint and stir to combine. Place the lamb shanks on a serving dish. Strain the liquid from the pan and skim off any fat. 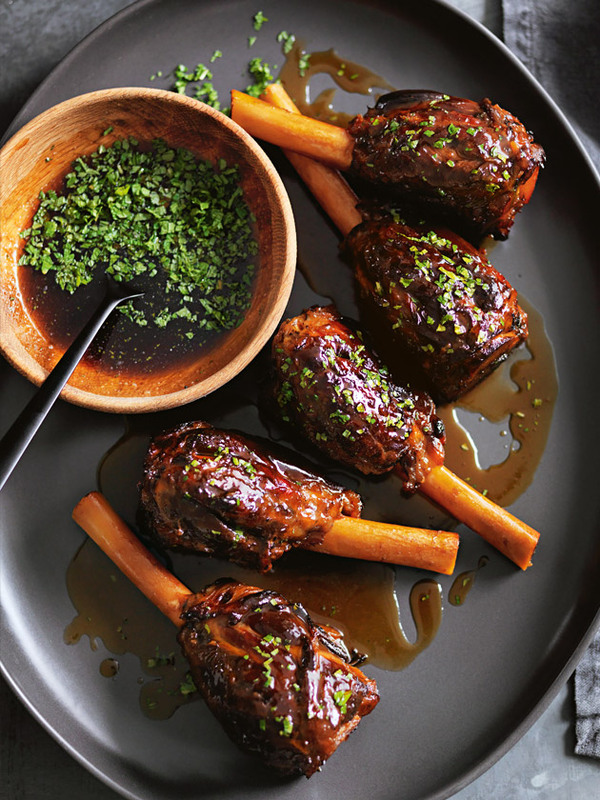 Serve lamb with the pan juices and mint sauce. Serves 12. Tip: You can make the shanks 1 day in advance. To reheat, place in a preheated 200°C (400°F) oven with their cooking liquid, covered in foil, for 20 minutes or until warmed through. Hi, Andrew. We think any roast root vegetable would be a perfect match, or even a simple mashed potato. Enjoy! The DH Team. Looks Great think i might do this on Saturday, just wondering what side dishes would pair well with this?? Great recipe! For coeliac friendly, can I replace the Malt Vinegar with Apple Cider Vinegar? Or should I use another substitute? Thanks!